A aviation buff himself, Rajeev Chandrasekhar proposed the Union Minister to to consider allocating a specific day for the Celebration of National Aviation Day. “April 15 marks the birthday of the Padma Vibhushan awardee, Indian Air Force Marshal Arjan Singh, DFC who was awarded the Padma Vibhushan for his distinguished service in commanding the IAF during the Indo-Pakistani War of 1965, and in 1966 became the first IAF officer to be promoted to air chief marshal. Also, in 2002, he became the first and only officer of the Indian Air Force to be promoted to five-star rank as Marshal of the Indian Air Force. This makes the date a popular and a suitable choice for celebrating and commemorating the heritage and success of the Indian Aviation Industry in the form of National Aviation Day.” Chandrasekhar wrote in his letter. “National Aviation Day would be India’s celebration of excellence in aviation; an occasion to recognize our air prowess and its stature in the global aviation industry. It would also be an occasion to celebrate the countless men and women who work round the clock to ensure the safety, strength, and success of the Indian Aviation Industry. It would also honor the pioneers who opened the skies as a way to connect people and move goods safely and quickly within our large nation and around the world.” the MP said. Citing the reason for the need for celebrating the National Aviation Day, Chandrasekhar said that the National Aviation Day, if designated would offer Indians an opportunity to witness and engage with the vibrant industry as well as also encourage the youth of India to pursue careers in Indian Aviation and its allied industries. He said that the United Nations has earmarked December 7 as the International Civil Aviation Day to raise awareness of the importance of international civil aviation. Many countries like the USA, Spain, Israel, Korea, Norway, Germany are few such countries that celebrate National Aviation Day to celebrate the history and development of aviation in their respective countries. 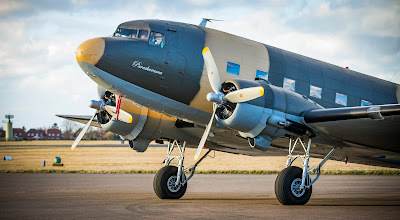 Recently, the fully restored Dakota DC-3 bearing the Tail Number VP 905 and called “Parashurama” was gifted to the Indian Air Force by Rajeev Chandrasekhar, Member of Parliament, Rajya Sabha on behalf of his father Air Commodore M K Chandrasekhar (Retd) VM, VSM, on 13th February 2018. It was formally inducted into the IAF Vintage Flight on May 4 2018 in a grand ceremony at Air Force Station Hindan.